On the corner of 78th and 88th Streets in Woodhaven, Queens, the smell of French fries wafts in the air. The mouth-watering aroma comes from Neir’s Tavern, the neighborhood’s local watering hole, which opened in 1829. 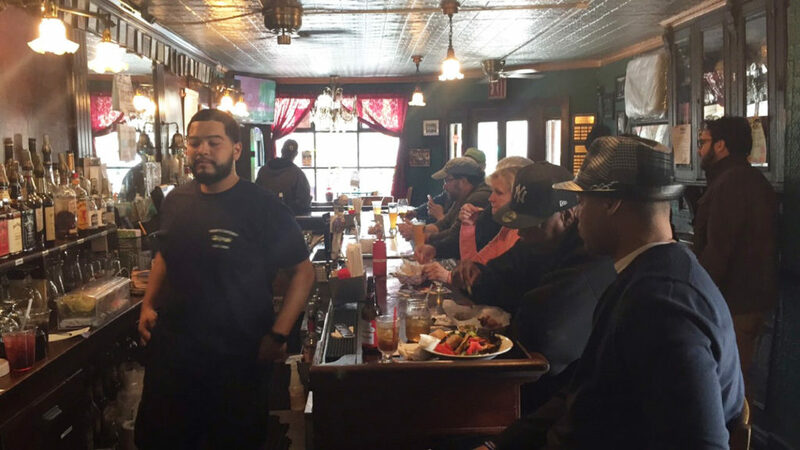 The bar is known for filling the glasses of patrons at the nearby long-gone Union Course horse racetrack and for being the location where the indoor bar scenes for the 1990 classic Mafia movie, “Goodfellas” were filmed. After almost 200 years of serving beer and memories, Neir’s Tavern and its community are fighting for the landmark status residents say it deserves. On May 7, the Woodhaven community rallied around its favorite bar in efforts to help the iconic site become a landmark, especially its interior. “This is the only bar in New York City where you feel like you’re not walking into a bar,” said Judith Roach, a retired banker and regular at the tavern. “I don’t want to see one of the oldest bars in New York City close down for good,” said Loycent Gordon, the owner of Neir’s since 2009. Rickety floorboards and green walls lined with “Goodfellas” posters adorn the bar. But Ed Wendell, the executive director of the Woodhaven Cultural and Historical Society, wants patrons to know that there is more to the bar than its connection to the famous flick. “Looking at it from a historic point of view, it does deserve landmark consideration. It’s the last physical remnant of the old racetrack,” said Wendell. “It’s going to be a long process, but we’re off to a good start,” said Wendell. A petition to landmark the interior of the bar has been filed, and dozens of patrons signed it at the rally the tavern held to call for support in its campaign. “Places like this establishment are rarer in modern New York City, and that is the push behind landmarking Neir’s Tavern. Preserving such a treasure like Neir’s Tavern will be a history lesson for future generations,” said Assemblyman Michael Miller, D-Woodhaven. As patrons drank their beers and laughed, Gordon said he hoped to preserve the bar’s history and its distinctive atmosphere for many more years to come. “I still believe the traditional values a bar like this can bring to this community, and I intend on preserving the history of it,” said Gordon.